I’d like to start by pointing out that I used both leftovers and frozen veggies from last season’s CSA in this somewhat unconventional hot dog. Yippee! Many times when I’m putting a dish together in my head, I find that I’m one or two ingredients shy of what I really want. Today, when I was thinking of ways to use my weekend leftovers, I was determined to only use the food that I had in the house. And I did! Brian’s hamburger. 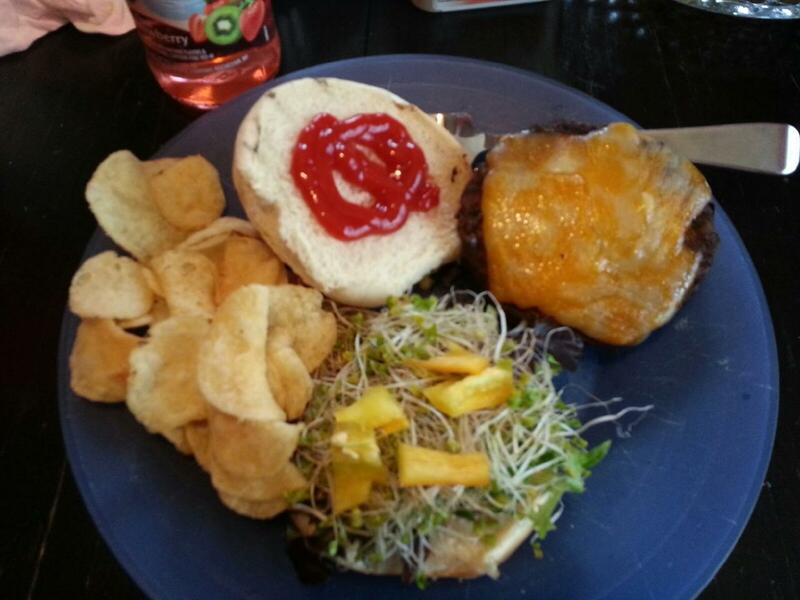 Yep, that’s broccoli sprouts on the bottom bun. They’re good on hot dogs, too! As per usual on hamburger and hot dog days, we had an odd conglomeration of leftovers – quite a bit of chopped onion, one and a half hot peppers, a couple of brats that got grilled but not eaten, etc. I knew that I wanted to use the leftover brats and hot dog buns, but I couldn’t decide what to top them with (sadly, we ate all the broccoli sprouts). So, I started making mental inventory of my fridge and my new, big shiny freezer. Ah ha! I have frozen cabbage from my CSA! And apples from my last farmer’s market trip! And leftover onions and hot peppers! Perfect. 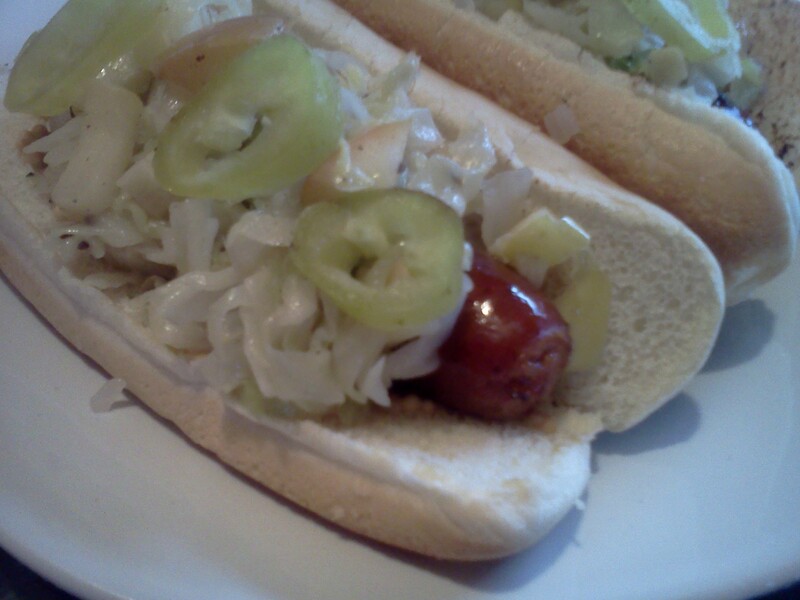 This made enough to easily top six good size hot dogs/brats. I’m thinking it will reheat well, but I’ll find out tomorrow! Sauté the onion and garlic with a bit of olive oil over medium heat. 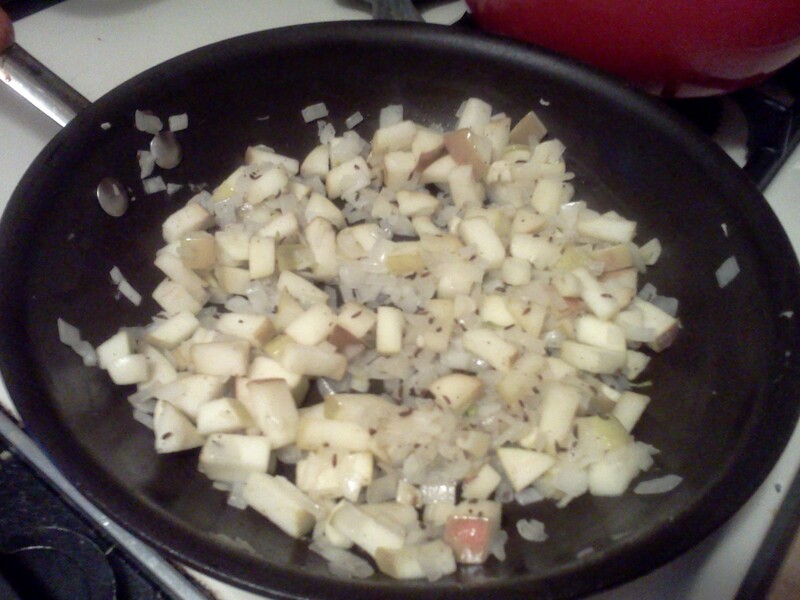 When the onions are translucent, add the apples, Caraway seed, salt and pepper. Continue cooking until the apples are soft. Remove the apple and onion mixture from the skillet and put off to the side. 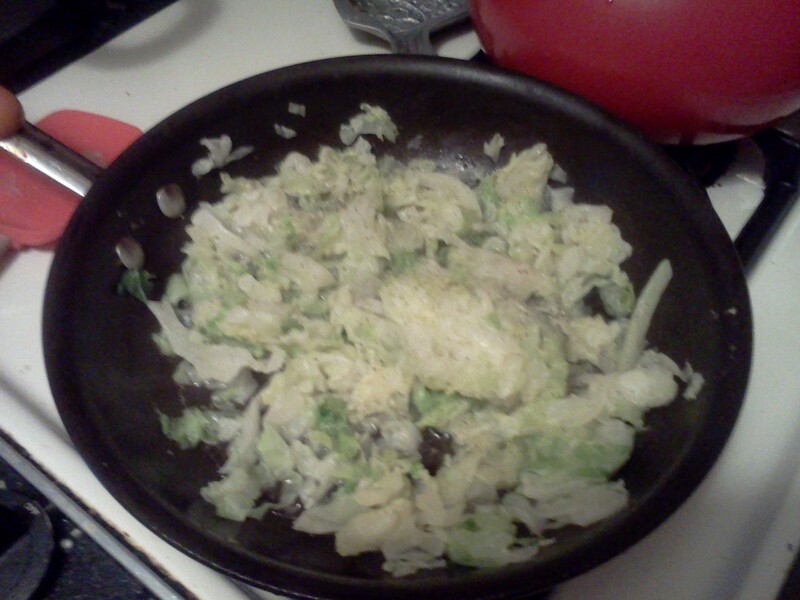 In the same skillet, add the cabbage. Now, because I did not plan ahead, I did not thaw the cabbage first. I just tossed the frozen hunk of cabbage right into the hot skillet and it worked just fine. Once it had thawed, I drained the excess water and turned the heat up to high. Stir the cabbage often so it doesn’t brown. When the excess water is cooked off and the cabbage is heated through, add the apple and onion mixture back into the skillet. Turn the heat down. Add the apple cider vinegar, stir and taste it – if you need to, add more salt and pepper. Continue cooking over medium/low heat for a few minutes to let the flavors meld. That’s it for the fried cabbage topping! I then started assembling my hot dog. Lightly toasted hot dog bun, whole grain mustard, spicy brat. 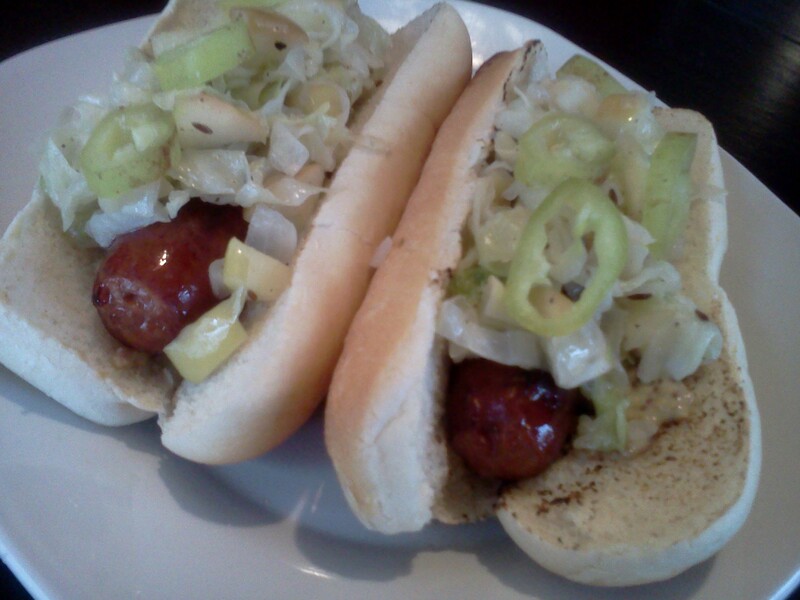 Top the hot dog/brat with the fried cabbage topping and rings of Hungarian hot peppers. Eat and enjoy!! Warning: These peppers range from mild to HOT!! and there’s no way to tell until you take a bite. If you’re not a fan of heat, you may want to skip these. In case you’re wondering, this particular pepper was hot enough that my lips were tingling after I ate it! Just the way I like it. 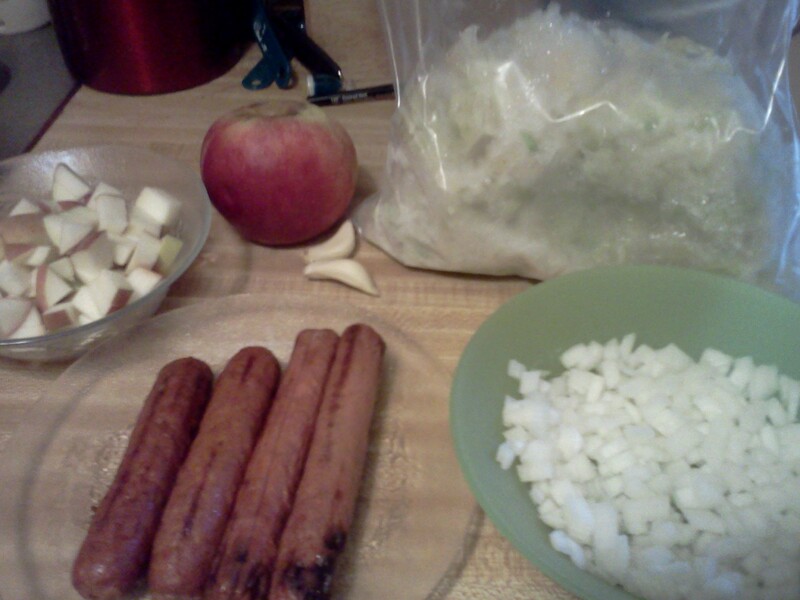 This entry was posted in CSA, Dinner, General, Lunch, Recipe and tagged apples, cabbage, frozen cabbage, hot dogs, hot peppers, leftovers, onions on April 16, 2013 by Melissa. Hmmm, maybe my dh would go for this. I think we’ve already passed cabbage season though. I got so much cabbage last year that I finally froze it out of desperation! This is the first time that I tried using the frozen cabbage, but it really held up well. I’ll probably make another version of this when cabbage season comes around again. This just made my mouth water! Looks so good! I think the crunch and flavor would be so good on a hot dog. What an interesting combination. I think you would have liked it – maybe with a milder pepper, though! I’m scratching my head wondering why I’ve never frozen cabbage before . . . but it’s probably because we go through it pretty quick around here. Thanks, Melissa, for a delicious idea using farm share goodies! Talk about creative. What a great use of cabbage. I’m super impressed. Thanks! It was good with pasta the next day, too. Yum! that looks so good! I think we will make that delicious fried cabbage topping when we buy the wonderful brats or Slovenian sausage from that little meat store in Barberton! Thanks fro the tips and for the recipe, Melissa! On a side note, the bread you gave us was the best that I ever had in my whole life. We toasted it to have with jam and we made french toast too. Tom and Jeff grilled the leftover bread the next day too! It was like ciabatta homemade but with a chewier better crust!